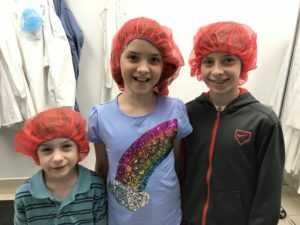 Last year, we were offered the opportunity to visit one of our favorite allergy-aware companies, Made Good. Trips to the Toronto area are pretty easy for us, but they usually happen on weekends, so we weren’t able to make it work last year. This time, we made a point to visit the wonderful people at Made Good. There used to be a show on the Food Network called “Unwrapped.” Have you seen it? They would walk you through the factory, showing processing of different foods. It’s mesmerizing to watch as the mixing drums spin, wrappers whiz around on spools and spindles, and blades rhythmically cut food into bars or squares. What 80’s kid doesn’t love Willy Wonka? Can you hear it? Those sounds, and thoughts of sweet chocolate rivers. Well, Made Good doesn’t have a chocolate river (or… perhaps they did, but didn’t want to risk me and my filthy crew falling in, only to be sucked into the pipes), they have so much more. What I noticed even before that was the smell when we first opened the door. It really is everything you would dream of, walking into a place that makes tasty allergy-friendly treats. We waited in a conference room for our host, Mr. Babak, who greeted us with smiles and warm hugs all around. We met the front of the house staff, and then got down to business. After suiting up in special protective gear (and let me say, we did look smashing in our hairnets, lab coats, and weighted safety shoes) we headed in to where the magic happens. After a special shoe wash, we headed to the sinks for clean-up, to be sure we weren’t introducing anything foreign into the processing area. Notice, no pictures of the adults all dressed up. In the fast-moving factory, we saw where raw materials come in, and they explained to us how they keep track of the ingredients from the field all the way to the factory. Inventory control is serious business when you are handling any food, but especially so for allergy-friendly foods. I’m not sure what I was expecting, but the production lines were much bigger than I thought they would be. They moved much more quickly too! I think one of my favorite parts was watching the chocolate chip waterfall sprinkling yummy morsels onto the tops of the bars. Or maybe it was the wrapping and boxing, zooming by so fast you could get dizzy from watching it. Something I hadn’t thought about was the need for different labels, depending on where the snacks are heading to. The U.S. and Canada have different labeling requirements, so they need to cover all the bases. Once everything was bundle onto a pallet, we told them where our van was parked. That was after they denied our request to have the semi being loaded make a direct trip to our house. The pallet request was denied too, but I totally understand. Customs and all. The excitement of the plant and the amazing treats they make were amazing, but even better was being introduced to factory staff. 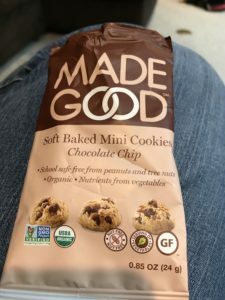 Many of the people working for Made Good have been with the company from day one, and I was sure to extend our deepest thanks to each and every one of them. I wanted them to see the faces of the people they do this for. That the commitment they make to the company has an end user, and that many times, that end user is a kid whose options may be limited due to allergies or other health-related issues. While many of those who enjoy the products do not have these restrictions, I wanted them to know that for us, the safety of the product is every bit as important as the taste. The products are wonderful and safe for us, and it was a fun operation to watch, but my favorite part was, by far, the people. 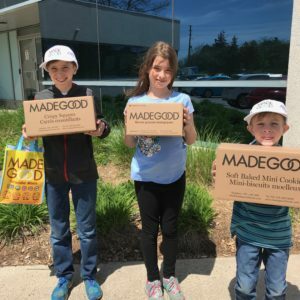 Made Good is a family business, and while many of us may think “Yeah, that would never would work for me!” they make it look easy. Brothers, sisters, and in-laws all working together to make the family business work. What is also so important (at least I think it is) is that they make these products not just to fill a need, but because they live it. 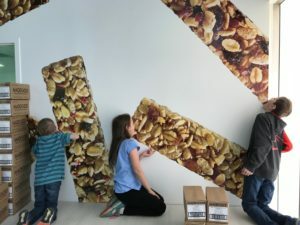 The family has been involved in the food business for a long time, but when a young family member wasn’t able to participate safely in school because of food allergies, they decided to put their knowledge of the industry into action. It is a business, and all businesses need to make money, but they put so much heart into it as well. It makes the snacks even sweeter. As I said, many of the factory workers there have been there from the beginning, and while they aren’t all blood-related, I could feel that many of them were family by choice. If you need us, we’ll be trying to get into their family somehow. Our kids are too young to marry into the family (yet). Maybe they’ll adopt us? Sponsor us to come there and become citizens? They can pay the kids in granola bars and cookies. We are open to any ideas you may have in how to make this happen. If only they made them this big. The new soft cookies. Oh my gosh! SO many ideas for these! In all seriousness though, Made Good really is made good: with heart, care, and a little extra sprinkle of love. I always tell my kids that the thing that makes all my cooking and baking extra good is the love I put into it. That’s exactly how I felt when we left the Made Good factory.